The swimming pool, set in the southern gardens, benefits from spectacular views to the summits of the mountains. The best months for swimming are April to October as the pool is not heated. 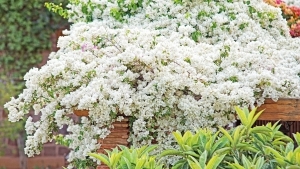 Kasbah Angour has 10 acres of gardens containing a wonderful mix of plants and trees, including native mountain species. There are many different areas to enjoy and explore. 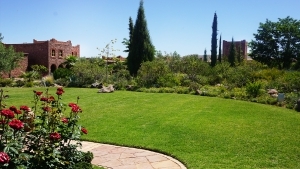 The southern gardens are planted with flower beds, trees & lawn to stroll across and appreciate the delightful vistas. There are also extensive terraces where you can enjoy the sunshine. 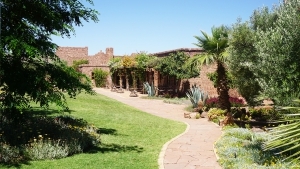 The northern side of the Kasbah has formal gardens, with rose and other flower beds, low hedges and fruit trees. There is a wonderful courtyard bordered by a pergola for al fresco dining. We must not forget the kitchen garden to the north-east of the Kasbah where many of the herbs & vegetables featuring in our menus are grown. The swimming pool is set in the southern gardens and benefits from the views to the summits of the mountains. As the pool is not heated, the best months for swimming are April to October. 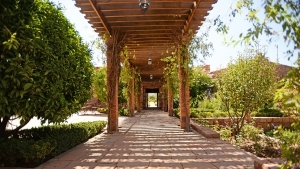 Kasbah Angour has 10 acres of gardens to enjoy. They contain an wonderful mix of plants and trees, including native mountain species. There are many different areas to explore. The southern gardens are planted with flower beds, trees & lawn. There are extensive terraces where you can enjoy the sunshine. You can stroll across the lawn and enjoy the delightful vistas. 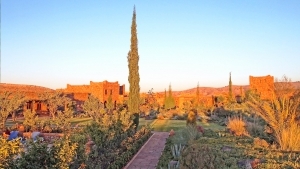 We must not forget the herb and vegetable garden to the north-east of the Kasbah.